Sonic the Hedgehog 45 is the forty-fifth issue of the Sonic the Hedgehog comic. This comic features one story: "Guerrilla Thriller". It also features the third part of "Knuckles' Quest". Some time ago, the Freedom Fighters came upon an ancient Mobian frozen in ice in a mountainside. They brought the Mobian back, nicknamed Mobie, but he acted quite violent to the group. They eventually learned to communicate with him through art and helped him set up a new home in the Mobian jungle. In Robotnik's headquarters in Robotropolis, Snively tries to convince Robotnik to set up a command center in the Mobian jungle, with many animals still living in it. Uncle Chuck listens to the plan nearby, while Robotnik expresses his displeasure at setting foot in that jungle due to the hot and humid temperatures and the plant-life. Snively, however, has planned for this, introducing the eco-destroyer which can do all the work needed. Uncle Chuck returns to Knothole Village and warns the Freedom Fighters of Snively's plan to invade the Mobian Jungle, which is home to Mobie and many other animals. Sally agrees that they must do something quickly, ordering the group to separate into two and get the jungle creatures deep into the jungle. Sally, meanwhile, will stay in Knothole with Uncle Chuck to determine a way to destroy the eco-destroyer. Rotor and Sonic go as one team, though Sonic's speed is way too much for Rotor to catch up to. After some time in the jungle, Sonic munches on some food while he finds Rotor, who's studying some berries instead of looking for the animals. He notes he had only stopped for a minute to study some rare berries he found that can induce sleep. Sonic opens his hands, revealing the exact same berries, which he has been eating, causing Rotor to panic. At that instant, Sonic yawns and lays down to have a nap...while a whole group of gorillas arrive on the scene, surrounding the two and leaving Rotor to defend himself. The gorillas take Rotor and Sonic to their camp as prisoners, forcing Rotor to prepare their meals and to create new technologies for them to fight with. Sonic tries to convince the gorillas that they are in danger by the eco-destroyer, but they don't believe him, thinking that it will never be able to find their camp. While watching Rotor stir some stew for the gorillas, Sonic gets an idea. He tells them that he can get new technologies for them from a hidden area nearby. If he brings them back, he and Rotor can go free. The guarding gorillas agree, telling him that they will be freed if Sonic brings back the weapons first. He leaves the hut with a wheelbarrow, starting the second part of his plan. Using his quick speed, he rushes into the gorilla's supply hut unnoticed, gathering their own supplies into the wheelbarrow. He dashes back with all the supplies, much to the gorilla's joy...until everybody realizes that Sonic accidentally threw the confused gorilla supply officer in the wheelbarrow as well. With the plan a flop, Sonic and Rotor are cuffed to some trees outside the huts. Sonic apologizes for messing up the plan, but Rotor is also sorry, as he knows that Sonic could've escaped had he not come along with him. The guarding gorilla orders them to be silent, making Sonic wonder why they are so aggressive. They previously were gentle, but Robotnik's tyranny has forced them to change, becoming tough and fearless. Suddenly, a whole group of the gorillas run past the two of them. They wonder what is up, until Rotor looks aside. Snively has arrived in the gigantic eco-destroyer, a multi-story tall lawn mower-like machine. It starts travelling through the jungle and enters the camp destroying everything in its path while the gorillas run off in panic. Snively arrives at Sonic and Rotor's location, disembarking the machine with a squadron of SWATbots. He is pleased to see that the two have already been captured, claiming them as his prisoners now. He heads back to the machine to notify Robotnik of Sonic's location, while Bunnie Rabbot and Tails, now with Mobie, arrive and notice them from behind a large boulder. As Snively enters the machine, the other Freedom Fighters rush out and attack. Mobie grabs one of the SWATbots by surprise and throws it into another bot, easily destroying the two. One of the other SWATbots notices Mobie and prepares to fire a laser at it, until Bunnie steps in and destroys its gun with her strength. Tails flies in and dispatches the other SWATbot, taking its gun and hitting it over the head with it. With the battle finished, the three walk over to Sonic and Rotor, who are quite pleased to see them. Bunnie updates the two on their journey, having found Mobie. They were going to take him back to Knothole, but they saw the eco-destroyer and decided to follow it. That reminds Rotor that they now have to find a way to destroy the eco-destroyer, which Rotor believes the gorillas will be able to help. Unfortunately for them, all the gorillas have fallen asleep, every single one. Rotor takes the blame, realizing that he put the sleeping berries in the stew so that they could escape. Now working on their own, Sonic decides that he must destroy the machine himself. First, Mobie helps him get free, easily destroying the shackle holding him to the tree. He also frees Rotor, allowing them to walk over to the now offline eco-destroyer. To ensure he is not killed if the machine is turned on, Sonic orders Tails to distract Snively while he enters the machine. He flies up to the cockpit of the machine while Sonic enters it. Snively, meanwhile, is talking to Robotnik, trying to convince him that the jungle is ready for conquest. Robotnik, now on his plane en route for the jungle, is still not convinced, ordering Snively to get rid of all foliage before he arrives. Snively ends the transmission and prepares to activate the machine, until he notices Tails mocking him in front of the cockpit window. He turns his attention to the flying fox, trying to zap him with some laser blasts. Tails avoids the shots and eventually flies off. Snively, now disgruntled, decides to take care of him later and prepares to activate the machine. He's interrupted, again, by Robotnik, who has arrived and wants to board the eco-destroyer to view the machine's destructive capabilities himself. Sonic, meanwhile, exits the machine just as Tails arrives at the ground, announcing that his mission was a success. With Robotnik's arrival, they decide to duck it out for a bit. On the machine, Robotnik orders Snively to destroy as much of the jungle as possible right away, but Snively rather wants to tell Robotnik a surprise. Robotnik doesn't want to hear it, starting the machine up. Rather than moving, the machine rattles violently and falls apart into a thousand pieces, leaving only the cockpit intact, and Robotnik quite angry. The Freedom Fighters, Mobie and the gorillas celebrate the successful destruction of the machine. Later on in the evening, the gorillas apologize to Sonic for making them prisoners and saving their lives. Sonic doesn't mind, as they are all in the fight against Robotnik together. Before they leave, Sonic asks the gorillas to say goodbye to Mobie in a few days. One of the gorillas is confused by this, until Sonic shows Mobie, asleep, having eaten half the pot of stew Rotor made. Knuckles may be the guardian of the Floating Island, knowing that his life will be full of challenges, but he never knew he would encounter the challenge that he does today. Kneeling before a female rabbit, she pats Knuckles head and kisses it, as Knuckles, now enslaved by the rabbit, hands her a plate of grapes. His mind remains intact, but he has no control over his body. He recalls what brought him into this mess, and must figure out a way out of it. Having begun his quest to find the King's crown and sword in Downunda with Tails, he met the Ancient Walkers that told him a long verse. Using the vague verse, and the Book of Myths that he had, he stumbled upon one of the people mentioned, the Charlatan and his imaginary forces. He eventually met with the kind Charlatan after he saw through his tricks and was told to find the Land of the Dark. Unfortunately, his quest got side-tracked when he helped Sonic fight Evil Sonic. He finally got back on track, enlisting the help of the Chaotix in where to go to next. They believed that the Land of the Dark was the old name for the Forbidden Zone on the island, so he ventured forth. On the way, in an uninhabited area of the island, he came upon two magical beings, one of which attacked him with bolts of lightning. The two beings were other beings mentioned by the Ancient Walkers: the sorcerer and the enchantress. Knuckles dodged the sorcerer's attacks, but left him open to the enchantress, who, with one look at her, caused him to fall under her control. He leaves the enchantress, carrying her tray of fruit, frustratingly thinking to himself that this won't be an easy battle to beat. As he does various chores for the enchantress, he thinks back to what the Ancient Walkers told him. ...there exist a sorcerer, wizard and alchemist that stand alone. Realizing that the sorcerer stands alone, he must not hang out with the other beings, leaving the enchantress to fend for herself. As he continues to do mindless chores, he also recalls the Ancient Walkers telling him that he must face the enchantress with patience. Having already faced the charlatan, and with no paladin around, he realizes that he must be patient. Unfortunately, to be patient, Knuckles endures the endless chores that he is forced to performed by the enchantress, including cleaning the floor, tending to her needs, making food, shining glassware and clothing the sorcerer. One day, with almost all hope lost, the sorceror and enchantress hear a noise, similar to stampede of horses, while one of the walls of their chambers begins to crack. Suddenly, through the wall, the paladin, a horse by the name of Sir Connery, bursts through. He raises his sword, letting off a bright light that holds back the two others. The light also frees Knuckles from the enchantress' control. Now free and feeling good, he jumps at the sorcerer, giving him a huge punch to the stomach. The sorcerer replies by launching lightning bolts at Knuckles, but having been able to think up a plan for some time, he jumps out of the way and grabs a bunch of trinkets off a nearby table into a cloth. To prevent the sorcerer from using the objects against him, Knuckles prepares to show off his own magic by making the trinkets disappear. Standing near a chest, he lets out a magical phrase and opens up the cloth, revealing nothing. The sorcerer gets distracted by the trick long enough for Knuckles to punch him again...while the trinkets were actually placed behind the chest. After securing the sorcerer and enchantress, the paladin and Knuckles introduce themselves. The paladin, once part of King Acorn's Royal Guard, had come back to purge the world of all black magic. Knuckles is curious about the sword, thinking it could be the King's sword, but the paladin reveals that it was given to him by the Ancient Walkers. Knuckles also asks the paladin to join him, but he cannot, as he must continue his own quest to rid of all realms of dark magic. As he picks up the sorcerer and enchantress to get rid of them, he tells Knuckles the next part of his quest: to find the evil Mathias Poe and Damocles the Elder, which could lead Knuckles to the King's crown and sword. As the paladin leaves, he also tells Knuckles to not look to the cavern filled with chaos, but the other caverns in the Floating Island that are filled with chaos. Now with the next clue, another goose chase, on his journey, Knuckles walks out to continue his quest on the Floating Island. 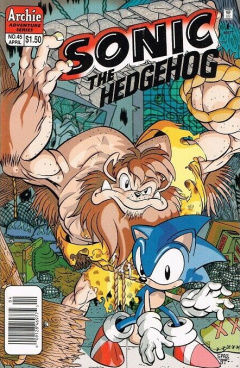 This is the first issue inked by Jay Oliveras in the main Sonic the Hedgehog comic series, having previously inked the Sonic Quest mini-series. Mobie reappears, after much fan support, last seen in issue 32. This page was last edited on 28 March 2019, at 17:40.